I am writing to thank you for the wonderful feature on me and my band in the current issue of Bluegrass Europe magazine. The entire article is just superb, and special thanks should also go to Jan for doing such a great job. I hope the lads in Acousticure don't mind too much! 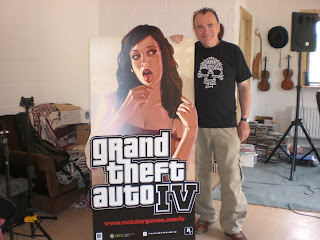 A recent develpment since your article is that all the Niall Toner Band CDs are now available worldwide as downloads from both iTunes and Amazon.com, and my tune from GTA4, 'Nun's Island Reel', is now also available in the USA as a ringtone on mobile 'phones... I hope this is seen as an encouragement to other writers and composers, in that you just never know where your songs and tunes are going to take you! Also, speaking of tunes and songs, as mentioned by Jan in his article, we are always keen to make our material available to other bands and artists to record. If there's anyone out there who is looking for original songs or tunes, please don't hesitate to contact me for demos and lyric sheets. Apart from the thirty-six originals on our three CDs, there are many, many more songs of mine just waiting to be discovered, and it's also worth bearing in mind that I also write in many other genres of music, including country, country-rock, and traditional Irish styles. My details are all on the Bluegrass Guide pages in Bluegrass Europe. Thanks again for all your encouragement and support, and NTB hope to get to meet with many more of you around Europe in the future. Greetings to everyone in the European bluegrass community! I have visited your web-page this morning and was pleasantly surprised by the amount of activity of bands performing. The Lonesome Road Band is scheduled to arrive in Austria on 26 July (with some luck from US Air) and can't wait to perform there! We were so welcomed by our Austrian friends last year that we immediately started to plan our 2008 before we returned to the United States. This year's plan has been coordinated with great help from Werner Lexer. A series of workshops and concerts will start on 28 July [see the EBB post of 2 June] and concerts by Lonesome Road to follow. Some conflicts within our band has forced us to change the line-up this year and we will introduce Brandon Couch on mandolin/vocals to the European bluegrass family. He is a talented young man from South Carolina, USA, and has agreed to fill in for our friend Paul Eaton for this season. Paul will be back with us in September. We would love the opportunity to meet bluegrass fans and have a chance to share our music and friendship with ya'. Looking forward to seeing you all! For information or contact in Austria,please e-mail Bernd Scheumann. This family will have our complete itinerary and booking information. All the best from our families! Gary Ferguson (guitar, vocals) will make his fourth consecutive tour of Ireland from 18 to 29 July 2008, together with Colin Henry (dobro, guitar), and with the singer Janet Holmes on some dates. The tour will include concerts, radio interviews, and a songwriter workshop with Mick Hanly. Full details are on the Bluegrass Ireland Blog. Gary will have a new CD available for the tour; Gary Ferguson and friends: Live at Podunk, recorded at the Podunk Bluegrass Music Festival in East Hartford, CT, with Mike Auldridge, Ron Stewart, Emory Lester, Gail Wade, Kene Hyatt, and Marc Roy. The Bluegrass Unlimited review of Live at Podunk can be read here. Adiaha Bürkmiller from Munich reminds us that the 2nd Munich Banjo-Camp takes place 7th to 9th November 2008. The 5-String-Intensive-weekend's teachers are Rüdiger Helbig (GER) and John Dowling (GB). There are only a few places available still, so if you want to participate, you have to act quickly! Further information may be found on www.banjocamp.de or by phone +49.176.23 64 07 02 (Adiaha Bürkmiller). The new CD NTB3 from the Niall Toner Band (IRL) is out today, 14 June. The release was delayed by the inclusion of a video, shot at Athy Bluegrass 2007 by Kate Bradbury, and a bonus track, 'Nun's Island Reel', aka 'The Real Reel', an Irish-style tune composed by Niall in the early '90s, and now included in Grand Theft Auto IV, the biggest selling video game in history. The tune will soon be available worldwide as a ringtone - it already is in the USA. NTB3 is available in all good record shops from today, and it and the two previous NTB CDs are also available on i-Tunes, via Amazon, from Bardis Music, or by post from the Niall Toner Band website. The band, which took part in the 2008 EWOB Festival, also has a MySpace site. The Tenth Coors Open House Festival will be held in the Cathedral Quarter, Belfast, Northern Ireland, on 24-8 September 2008. The programme for this year can now be seen on the Festival website or in a 48-page brochure. In addition to strong elements from Irish traditional and other genres, over a dozen bands - mostly from North America - represent a wide spectrum of bluegrass/old-time/cajun/mountain folk music. They include the Wilders (USA), who toured widely in Europe in 2007; the Rockridge Brothers (Sweden); the Samsonites (USA/NL); the Southern Tenant Folk Union (UK); and Prison Love (IRL). More details and sound clips are on the Festival website. In addition to the stage shows, there will be bluegrass and old-time sessions and a master class in American-style fiddling. Note: from 16 July to 6 August this year, the Rockridge Brothers will be touring in New York, Pennsylvania, Virginia, and West Virginia, including the famous Clifftop old-time festival. Full details are on their MySpace site. The Third Coastline Bluegrass Music Event took place last weekend at Plas Uchaf Farm, near Llandudno Junction, North Wales. You can now see here dozens of photos taken at the Event, showing lots of people enjoying themselves in fine weather at a beautiful location - together with G2 Bluegrass Band, the Sons of Navarone, and Longway. Thanks and congratulations to the organisers of the Event, which also has a MySpace site. The Twelfth European World of Bluegrass Festival will take place on 21-22-23 May 2009 at 't Trefpunt, Voorthuizen, the Netherlands. Remember: you read the dates here first on the EBMA's European Bluegrass Blog! Two of our recent houseguests were Nashville musicians who both host bluegrass programs on Sirius Satellite Radio, here for the European World of Bluegrass 2008. They told us that Sirius Bluegrass was programming a track every hour from the 10 years of European World of Bluegrass CD throughout the month of May. We'd like to say thanks to Sirius for that great airplay, and to Rounder for their generous community spirit, reflected by their mailing our 10 years of EWOB CD to bluegrass and Americana radio in the USA. This tremendous support means a lot to so many musicians. America and Europe join hands. Cor & Greet Sanne of CMS Productions announce that Jimmy Bowen & Santa Fe, based in Nashville, will play an exclusive European concert on Wednesday 9 July in the Turfschip, Zuideinde 15, in Nieuwkoop, the Netherlands. 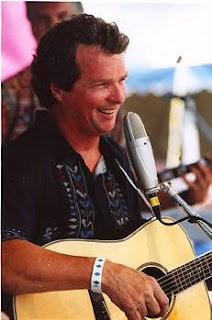 Jimmy Bowen (mandolin, lead vocals), from North Carolina, played from 1988 to 1995 with the world-famous Charlie Waller & the Country Gentlemen, and later with David Parmley & Continental Divide before forming his own group at the end of the 1990s. A high point in their career has been playing for the US president at the White House in Washington. Rick Briggs (banjo, vocals), also from North Carolina, has been playing music since he was 13, with bands including those of Dale Ann Bradley and Connie Smith. Bobby Nicholas (lead guitar, vocals), from Canada, now lives in the USA, and has played guitar for Terri Clark and Patty Loveless. Blake Bowen (electric bass), Jimmy's son, has been a member of Santa Fe since the band began. Ollie O'Shea (fiddle) is no stranger to country, bluegrass, western swing, or Americana. He has also played with Buddy Miller and Jim Lauderdale, and in Greg Cahill's Chow Dogs band which toured Europe a few years ago. Doors open at the Turfschip on 9 July at 19.15 hrs. The show begins at 20.00, with two sets of 45 minutes. Admission €15. Only 90 seats are available, so tickets should be reserved by e-mail. Intimate and extremely cosy concerts at this venue only! Great sound system. CDs available during intermission and after the show. 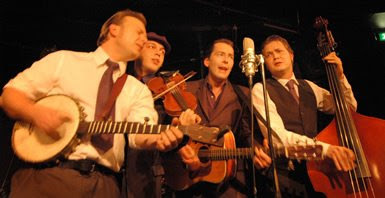 The Chapmans (USA), who made a big impact with their appearance at the EBMA's European World of Bluegrass Festival in 2005, are putting three new videos on line for the enjoyment of their fans. The videos can be seen here. From 25 July to 3 August the association 'Forum Lesachtal' hosts the first Lesachtal Valley festival Bluegrass in the Alps. The valley is located in the very south of Austria, at the interface of Germanic, Slavic, and Romanic cultural areas. Therefore it is predestined for interacting of different people, cultures, and musical styles. Bluegrass in the Alps offers a fascinating punch of workshops and concerts with the American top bluegrass ensemble Lonesome Road Band. The famous guitar player John Keith attended Dolly Parton for four years in the US. Banjo player Charles Wood, award-winning national banjo champion, was already a guest of David Letterman. The workshops take place at Volksmusik-Akademie in Liesing/Lesachtal, respectively at 9-12 a. m. and 2-5 p.m. Applications: E-mail to Forum Lesachtal. Applications are valid with the assignment of the participation fee. No refunding of the participation fee! Saturday 2nd August, 8.00 p.m. This information can be read in German here, or in both English and German on the festival website. The Country & Western Friends Koetz 1982 e.V., dedicated to fostering and promoting country music, held their 25th Internationale Kötzer Country Music Festival on 23-4 May, with six international bands and over 600 fans in the Kötzer Günzhalle, Kötz, Germany. The festival presents a wide spectrum of country music. Bluegrass has always been a important part, and US artists such as the Nashville Bluegrass Band, Weary Hearts, and Jim Eanes have played there in the past, as well as many major European bluegrass bands. This year the Kötz audience gave a great reception to Four Wheel Drive (NL/D/B), with Ulli Sieker of the Looping Brothers on mandolin. Peter Wroblewski, president of the Country & Western Friends, says: 'Never before had a bluegrass band such success at our festival!' A full account of the festival (in German) is on the Friends' website, together with many photos. Joost van Es (fiddle) will be playing for the Friends again in July as a member of the Gail Davies Band at the Pfleghofsaal, Langenau.